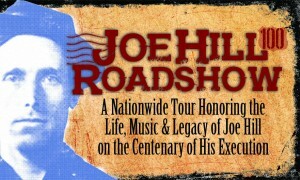 Joe Hill Road Show. Concerts in Chicago, Madison, Milwaukee, Oshkosh, St. Paul, and more. First published in the March 1916 edition (9th edition; “Joe Hill Memorial Edition”) of the IWW Little Red Songbook. Introduced and read by Utah Phillips, Steve Earle, discussed by Tom Paxton; introduced and sung (to new tunes) by Fred Alpi and Chico Schwall. October 7, 1879: Birth of Joe Hill (as Joel Hägglund) in Gävle, Sweden. December 7, 1887: Joe Hill’s father, Olof, dies during operation to treat injury from job accident. October 3, 1900: Joe Hill released from hospital after surgery and long convalescence from tuberculosis contracted as a rope maker (a trade he began work at at the age of 12). Returns to Gävle – working in shipyard, plays piano in local cafés, and joins the Gävle Workers’ Federation. January 17, 1902: Joe Hill’s mother, Catharina, dies. October 28, 1902: Joe Hill (and his brother) arrives in New York City from Sweden. April 18, 1906: Joe Hill in San Francisco Earthquake; writes about it for Swedish newspaper Gefle Dägblad. August 27, 1910: Joe Hill publishes his first article in the Industrial Worker. March 2, 1911: IWW wins Fresno, California, Free Speech Fight. April 30, 1911: Joe Hill leaves San Pedro, California, to join Mexican Revolution. June 22, 1911: Joe Hill flees to California after Mexican troops crush Magonista rebellion. July 6, 1911: Joe Hill’s song “The Preacher and the Slave” (Long-Haired Preachers) published in IWW’s Little Red Songbook. March 20, 1912: Joe Hill joins San Diego Free Speech Fight. March 27, 1912: Start of 8-month Fraser River Strike by IWW railroad construction workers, British Columbia. Joe Hill joins 1,000-mile picket line, writing several songs to bolster spirits on the picket line. March 31, 1912: Joe Hill is IWW speaker at Free Speech League rally in San Francisco Building Trades hall, speaking on San Diego Free Speech Fight, in which he participated. April 8, 1912: Joe Hill arrives in Fraser River Valley, Canada, to support striking IWW railroad construction workers. May 9, 1912: Joe Hill’s song “Where the Fraser River Flows” published in Industrial Worker. July 18, 1912: Joe Hill elected secretary of San Pedro IWW longshore strike committee. August 1, 1912: San Pedro longshore strike defeated, Wobblies blacklisted. January 1913: Joe Hill’s song “Mr. Block” published in Industrial Worker. February 16, 1913: Joe Hill song “Scissor Bill” published in Industrial Worker. March 6, 1913: Joe Hill’s “There Is Power in a Union” first appears in IWW Little Red Songbook. April 3, 1913: Joe Hill’s anti-war song “Should I Ever Be A Soldier” first published in Industrial Worker. April 10, 1913: Joe Hill’s song “The White Slave” first published in Industrial Worker. May 29, 1913: Joe Hill’s song “Stung Right” published in Industrial Worker. July 9, 1913: Joe Hill leaves San Pedro, California, jail after 30 days on vagrancy rap stemming from his role in longshore strike. Blacklisted, he soon heads to Salt Lake City. July 10, 1913: Industrial Worker reports IWW win in strike against Utah construction contractors. August 12, 1913: Gun thugs break up IWW street meeting, Salt Lake City. January 10, 1914: Murder of Salt Lake City grocer provides pretext for frame-up of Joe Hill. January 12, 1914: Salt Lake City police arrest man who likely committed the murder Joe Hill was executed for. January 14, 1914: Salt Lake City police shoot, nearly kill, Joe Hill in his bed. January 22, 1914: Joe Hill pleads not guilty; police condemn him as writer of IWW songs. January 28, 1914: Joe Hill’s preliminary hearing; police soon “lose” transcript. June 10, 1914: Jury selection begins in Joe Hill trial; judge packs jury pool to defeat defense challenges. June 19, 1914: Judge in Joe Hill trial “corrects” witness testimony to preserve prosecution case. June 24, 1914: Defense testimony shows Joe Hill could not have been shot during Morrisey robbery. July 8, 1914: Joe Hill sentenced to death. May 28, 1915: Utah Supreme Court hears Joe Hill appeal; rules state has no obligation to prove charges. October 31, 1915: Salt Lake City IWW Secretary R.J. Horton shot in back, killed; the killer is feted the next day at the Elks Club. November 9, 1915: Huge New York City rally demands Joe Hill be freed. Speakers include Joe Ettor, John Reed and Jim Larkin. November 16, 1915: American Federation of Labor convention delegates demand new trial for Joe Hill. November 19, 1915: IWW organizer and songwriter Joe Hill murdered by Utah authorities. November 25, 1915: Tens of thousands pack Joe Hill funeral, Chicago. February 14, 1929: Real killer freed by Salt Lake cops in Joe Hill case involved in St. Valentine’s Day Massacre, Chicago. November 18, 1988: Last of Joe Hill’s ashes released from federal government custody. They had been seized from the mails by the government in 1917 under the Espionage Act and secretly held for decades. 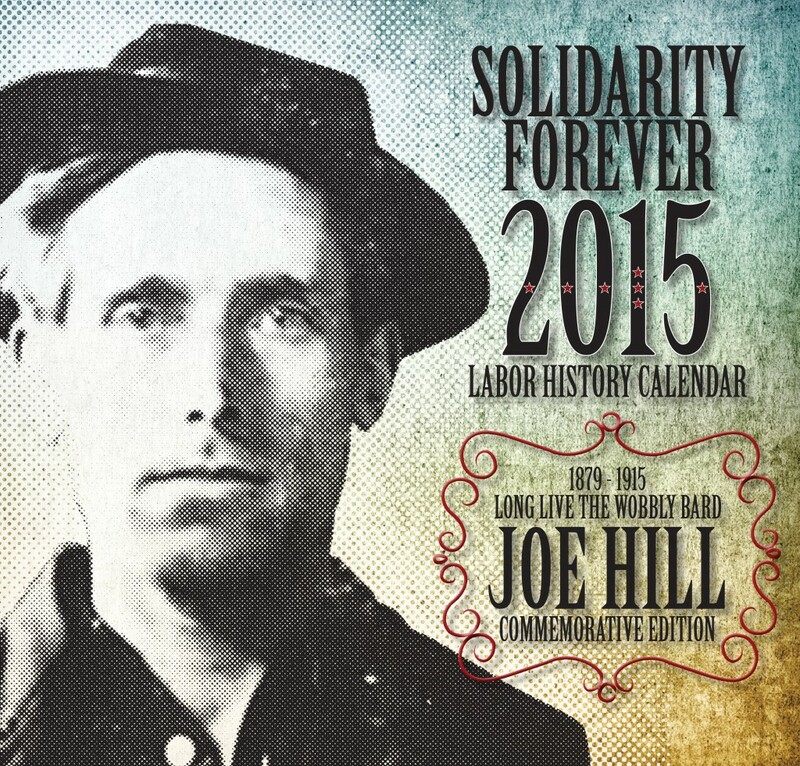 Release of Joe Hill centenary edition of “Solidarity Forever” Labor History calendar. 11/14/2014 Joe Hill 100 Years Part 3, Labor/Migrant/Gulf Group Exhibition. Uri-Eichen Gallery, 2101 S. Halsted, Chicago. Features work by more than 70 artists from around the world. Opening features Bucky Halker singing songs of Joe Hill. 8 p.m.
1/16/2015 Proposals due for 47th annual conference of the Pacific Northwest Labor History Association. Come to Seattle May 1-3 to Celebrate the 100th Anniversary of the writing of Solidarity Forever, Honor the life of Joe Hill on the centennial of his execution, and Act to strengthen and rebuild the labor movement for a secure future. 1/17/2015 Participatory readings celebrating the life of Joe Hill. Western Workers Labor Heritage Festival, Machinists’ Hall, Burlingame, California. Exhibition: 3/14/2015: Joe Hill – martyren från Gävle. Länsmuseet/Gävle, Sweden. The website includes information on the exhibit, which will run for several weeks, and on related events. 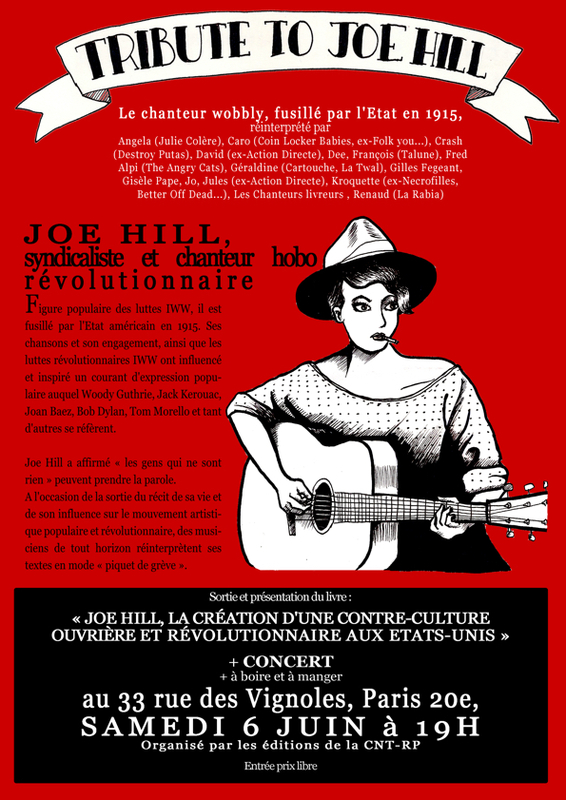 Film Showing & Joe Hill Songs: 3/25/14: La Maison des Métallos (Steel Workers House), Paris, France. Release party for new Les Mutins de Pangée documentary on Howard Zinn, which includes segment on Joe Hill. Fred Alpi will perform Joe Hill songs. Exhibition: 4/10/2015 Joe Hill 100 Years Part 4: Killed, paintings by James Wechsler. URI-EICHEN Gallery, 2101 S Halsted, Chicago. 5/1-2/2014 Chicago Commemoration. Among events being organized are a Friday night concert and ceremonies at the Haymarket Monument on Friday May 1 (Illinois Labor History Society, Noon) and at Waldheim Cemetery Saturday May 2 (11 a.m., includes scattering of ashes of former IWW General Executive Board chair Fred Lee, who secured the release of Joe Hill’s ashes from federal custody). 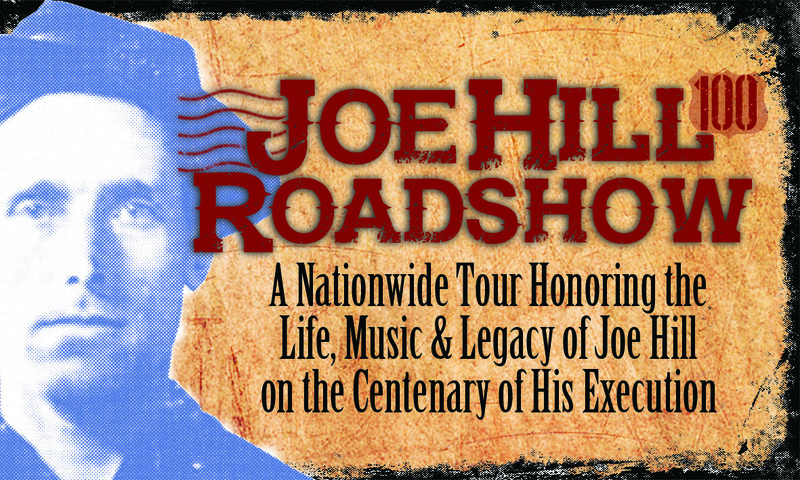 Concert: 5/1-10/2015 Joe Hill Road Show. Concerts in Chicago, Madison, Milwaukee, Oshkosh, St. Paul, and more. 5/1-3/2015 Pacific Northwest Labor History Association conference, celebrating the centenary of the writing of “Solidarity Forever” and honoring the life of Joe Hill on the centennial of his execution. Seattle, Washington. Concert & Book Release: 6/6/2015. Tribute to Joe Hill celebrates release of a new French translation of Franklin Rosemont’s book on Joe Hill and working-class culture, and several musicians performing Joe Hill’s songs in French and English. CNT complex, 33 rue des Vignoles, 75020 Paris, France. 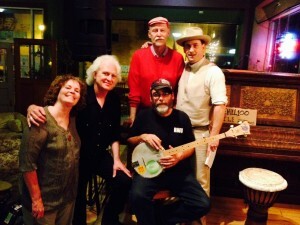 Concert: 6/13/2015 Joe Hill Roadshow featuring Magpie, George Mann and Charlie King. Guthrie Center, 2 Van Deusenville Road, Great Barrington MA. 6/8/2015 Chico, Calif. Sierra Nevada Brewing Company, 1075 E 20th St.
6/11/2015 Modesto, Calif. Church of the Brethren, 2301 Woodland Ave.
6/19/2015 Richmond, Virginia. Singleton Center for Performing Arts, 922 Park Ave.
7/14/2015: Poetry & Music: Bastille Day, Words on the Anniversary of Joe Hill’s Death. LaborFest, San Francisco. Tuesday, July 14, 7:00 p.m. Free. First Unitarian Universalist Church – 1187 Franklin Street. Poets Judith Ayne Bernard, Dorothy Payne, John Curl, Mahmaz Badihian, Jack Hirschman, Agneta Falk, Karen Melander Magoon and others. Music with Troubadour Vic Sadot. 7/15/2015: Film: “The Ballad of Joe Hill”(1971, Sweden) by Bo Widerberg. San Francisco. FilmWorks United International Working Class Film & Video Festival. Wednesday, July 15, 7:00 p.m. Free. ILWU Local 34 Hall, 801 2nd St. next to AT&T Ball Park. This dramatic film tells Joe Hill’s story as an immigrant coming to the United States. This rarely seen Academy Award-nominated film is about an ingenious immigrant labor organizer who is framed on a murder charge in a highly sensationalized trial with little evidence. Despite worldwide appeals, Hill is martyred by a Utah firing squad after one of the most controversial capital punishment trials of the 20th Century. Today, on the hundredth anniversary of his death, the state of Utah has reinstated the firing squad. Despite the bullets that ended his life, his legacy, humor, principles and solidarity with workers of the world live on. Saturday, July 25, Philadelphia: Magpie, Charlie King and George Mann with special guest John Braxton in concert. University Lutheran Church, 3637 Chestnut St., 7:30 p.m. Sliding Scale, $10 – $30, children $5. Sponsored by Crossroads Concerts; co-sponsored by American Swedish Historical Museum and IWW Hungarian Literature Fund. Sunday, July 26, Ithaca, NY: Magpie, The Burns Sisters and George Mann in concert. The Space at Greenstar, 700 W Buffalo St., 7:00 pm. $15, no one turned away for lack of funds. through Sept. 7: Exhibit: Joe Hill – martyren från Gävle. Länsmuseet Gävleborg, Gävle, Sweden. 8/13-15/2015 Still Building Internationalism Conference, Gävle, Sweden. Three days of music, books, and organized discussions around the topics of Work and Migration, Work and Repression, and Building Internationalism, Connecting Struggles. Organized by the SAC union,Joe Hill-sällskapet and Federativs Förlag, the conference will be attended by members of self-managed and radical unions across Europe. Click here for information on registration. 9/6/2015 Exhibition on life and legacy of Joe Hill opens at American Swedish Historical Museum, Philadelphia. Ran through Labor Day 2016. 9/7/2015 Concert: Bucky Halker sings labor songs at the historic Pullman site in honor of Labor Day and Joe Hill. Pullman Historical Site (Chicago suburbs), Noon – 2:00 p.m., free. Exhibition on life and legacy of Joe Hill continues at American Swedish Historical Museum, Philadelphia. 10/4/2015 Concert: Joe Hill Roadshow, Atlanta, Georgia, 7:00 p.m. With I Want Whiskey, George Mann, Lee Furey, Jumpin’ Jesus Christers, and Craig Rafuse. Sunday, Oct. 4, Eyedrop, 88 Forsyth Street, Georgia. $10 – $20 sliding scale. 10/8/2015 Concert: Bucky Halker. Woody Guthrie and songs of the Dustbowl. The show will also include several Joe Hill songs. Chillicothe Library, 430 N Bradley Ave, Chillicothe, IL. 2:00 p.m., free. 10/9/2015 Joe Hill Roadshow, Louisville, Kentucky. 7:00 p.m. With John Gage, Will Oldham, Sue Massek, John Paul Wright, Walter Thomas Beck (poet), The Joe Hill Players and Special Guest Ira Grupper. Nelligan Hall, 2010 Portland Ave. $10. 10/10/2015 Concert: Shelby Bottom String Band, The Cantrells, Todd Sharp, Jack Herranen & The Little Red Band and others commemorate Joe Hill. Nashville, Saturday Oct. 10, 7:30 p.m.
Douglas Corner, 2106 8th Avenue South, Nashville TN 37204. Tickets $12 advance, $15 at the door. (Checks can be mailed to TAP, PO Box 60338, Nashville TN 37206) Sponsored by Tennessee Alliance for Progress, Nashville Peace and Justice Center. 10/17/2015 Concert: Joe Hill Roadshow in Pittsburgh. 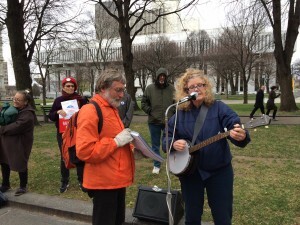 Anne Feeney, Mike Stout and the Human Union, and Smokehouse Lightning. Saturday, Oct. 17, 1:00 – 4:00 p.m. The Pump House (location of the Historic Battle of Homestead), 880 E. Waterfront Dr., Munhall, Pennsylvania. 10/22-24/2015 Conference: The North American Labor History Conference will feature a round table on Joe Hill’s legacy and other events. Detroit, MI. 10/23/2015 Concert: An evening of Rebel Music commemorating Joe Hill’s centenary with Len Wallace, The Adrays, and The Slowdown. Friday Oct. 23, 8:00 p.m.,Cass Commons, 4605 Cass at Forest, Detroit. Sponsored by the Detroit Branch of the IWW, the Michigan Chapter of the National Lawyers Guild, and the Sugar Law Center for Economic & Social Justice. $10 donation. 11/5-28/2015 Play: The Subversive Theatre Collective presents Si Kahn’s “Joe Hill’s Last Will.” Thursdays, Fridays and Saturdays at 8 p.m. Tickets $25, $20 for students, seniors and union members, Thursdays are pay what you can. Manny Fried Playhouse, 255 Great Arrow Avenue, Buffalo NY (third floor of North Buffalo’s historic Great Arrow Building). 11/7/2015 Concert: “Joe Hill…The Man Who Never Died… 100 Years Ago!” Everett, Washington. Featuring Gary Kanter, Friends & Fellow Travelers. 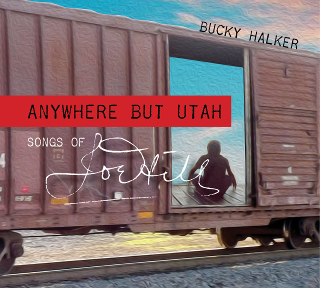 Saturday, Nov. 7, 7 p.m. Firewheel Community Coffee House 2727 Colby Ave.
11/13/2015 Concert: Bucky Halker, Anywhere But Utah – The Songs of Joe Hill. Friday, Nov. 13, 7:00 p.m. Uri-Eichen Art Gallery, 2101 S Halsted St, Chicago. 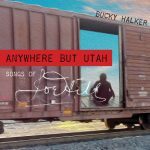 Bucky will be sharing new recordings from his new release “Anywhere But Utah – The Songs of Joe Hill” in commemoration of the 100th anniversary of the murder of Joe Hill. Some of these songs have never before been put to vinyl, disc or acetate. Doors will open at 6:00 p.m. for an exhibition of artwork from the IWW, the Illinois Labor History Society, Fight for Joe Hill, Molly Crabapple and Jon Langford, and a talk by public historian Paul Durica. The exhibit runs through Nov. 23.
will speak on The Man Who Never Died: The Life and Legacy of Joe Hill After a Century, 7 p.m., Dumke Legacy Hall in the Hurst Learning Center at Weber State University; free. 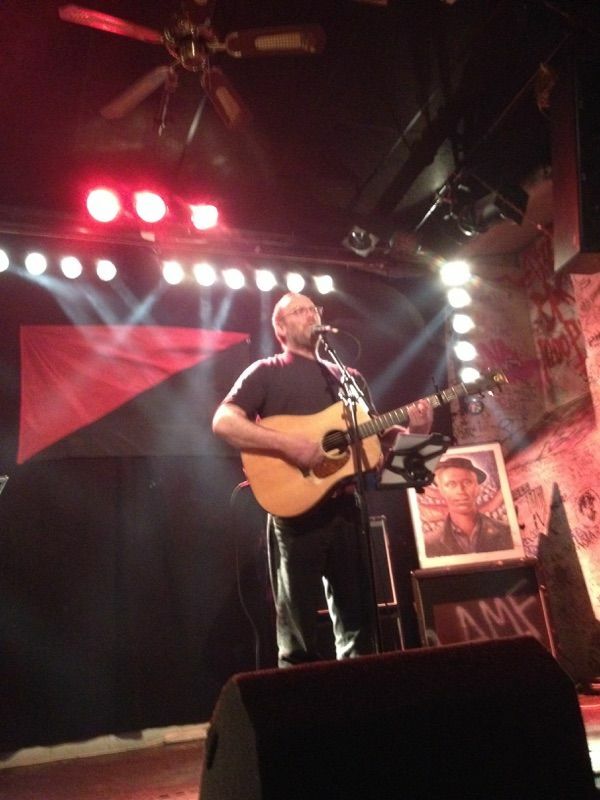 11/17/2015 Tom Morello & Friends Joe Hill Memorial Concert. Tuesday, Nov. 17, 8:00 p.m. Troubadour, 9081 Santa Monica Blvd. Los Angeles. Performers include: Tom Morello, Joan Baez, Ziggy Marley, Van Dyke Parks, Boots Riley, Rich Robinson, The Last Internationale, Tim Armstrong, Wayne Kramer, Jill Sobule, David Rovics, and Built for the Sea. Part of events marking the centenary and celebrating the release of the new edition of The Letters of Joe Hill. Tickets $20. 11/18/2015 Lecture: William Adler, Salt Lake City, Utah. Adler, author of The Man Who Never Died, speaks at 7 p.m. at Ken Sanders Rare Books, 268 S. 200 East, Salt Lake City; free. 11/19/2015 Vigil to mark centenary of the execution of Joe Hill, Salt Lake City. Sugar House Park,1400 East 2100 South, 6:00 p.m.
11/19/2015 Vigil: 7:21 a.m. Si Kahn & John McCutcheon will stand vigil on the very spot where Joe Hill was tied to a chair, blindfolded and, with a paper heart pinned to his chest, shot to death by a firing squad. Anyone in the Salt Lake City area is invited to join. 11/19/2015 Concert: Bucky Halker and Lil’ Rev,“Anywhere But Utah – The Songs of Joe Hill.” 7:30 p.m., Beulah Briton House, 2590 S Superior St., Bayview, WI. Donation. 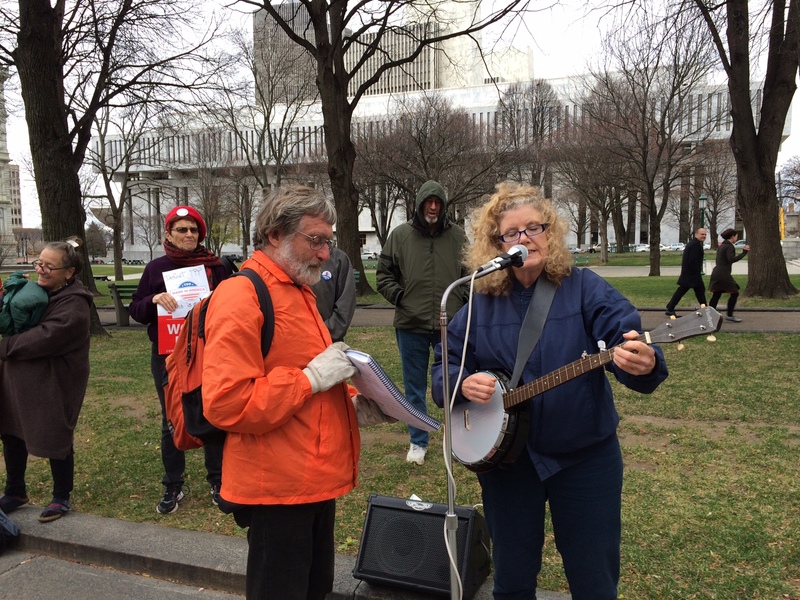 11/19/2015 Soapboxing: The Upstate New York Branch of the Industrial Workers of the World will lead a traditional soapboxing demonstration at noon, on Thursday, Nov. 19 ,at Washington Avenue, downtown Albany, on the sidewalk adjacent to West Capitol Park. Presentation & Concert: That evening, IWW delegate Greg Giorgio will discuss Joe Hill’s Legacy and lead a sing-along of Joe Hill’s songs. 6:30 p.m. at the Altamont Free Library. 11/19/2015 Concert: John McCutcheon, “Joe Hill’s Last Will.” Salt Lake City. The State Room. 11/19/2015 Bo Widerberg’s film Joe Hill will be shown in a newly restored and digitally remastered version produced by the National Library of Sweden as part of a Joe Hill Centenary event in Melbourne, Australia, on Thursday, Nov. 19. Victorian Trades Hall, Lygon and Victoria Streets, Carlton, commencing at 5.00 p.m.
11/19/2015 Concert: Anne Feeney, Honoring the Legacy of Joe Hill. Sponsored by NW Oregon Labor Council. 8 p.m. Alberta Rose Theatre, 3000 NE Alberta St., Portland OR 97211. 11/19/2015 Soapboxing. The General Executive Board of the Industrial Workers of the World has called for Wobblies and others to emulate Joe Hill on the centenary of his execution by speaking on a sidewalk, public park or other public place about Joe Hill and the struggle for workers’ emancipation. A pamphlet issued to support the actions is available as a free download. 11/19/2015 The Letters of Joe Hill. Former IWW General Secretary-Treasurer Alexis Buss will discuss the life and legacy of Joe Hill, and in particular his writings collected in the new expanded edition of The Letters of Joe Hill (for which she collected extensive new material and updated and expanded the notes). John Braxton will sing Joe Hill’s songs. Thursday, Nov. 19, 6:30 p.m., Swedish American Historical Museum, Philadelphia. 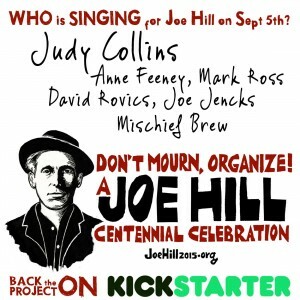 11/20/2015 Concert: “Joe Hill…The Man Who Never Died… 100 Years Ago!” Seattle, Washington. Featuring Gary Kanter, Friends & Fellow Travelers. Friday, Nov. 20, 7 p.m. Couth Buzzard Books, 8310 Greenwood Ave., Seattle. 11/20/2015 Don’t Mourn, Organize! Performances in Celebration of Labor Troubadour Joe Hill. New York City. Amy Goodman of Democracy Now! will lead a group of musicians and actors in a rousing evening honoring the great labor troubadour Joe Hill: Musicians Allison Moorer, Stephen Said, Son of Nun and Jamie Kilstein, actors Susan Pourfar and Brian Jones, comedian Hari Kondabolu, and writer Walter Mosley. Friday, Nov. 20, 7:00 p.m. New School’s Alvin Johnson/J.M. Kaplan Hall, 66 W 12th St., Manhattan. The event celebrates publication of the new edition of The Letters of Joe Hill. Admission free, but tickets required. 11/20/2015 Concert: John McCutcheon, “Joe Hill’s Last Will.” Denver, CO. Bread & Roses Cultural Center. 11/20/2015 Commemoration Concert: Kansas City MO. Danny Cox, Dr. Joyce Downing, Tom James, Bill Clause, Kasey Raush & Scott Stanton, Ariana Eakle, Bob & Diana Suckiel and more. Friday, Nov. 20, 7:30 p.m. Trailside Center, 9901 Holmes Rd. $15 donation. Be prepared to sing. 11/21/2015 Concert: John McCutcheon, “Joe Hill’s Last Will.” Cedar Rapids, Iowa. Legion Arts. 11/21/2015. Joe Hill Roadshow, Knoxville TN. Jack Herranen & the Little Red Band, Black Atticus, Shelby Bottom Duo, Matt Kinman & Friends. Saturday, Nov. 21, Potluck 5:00 p.m., Show 7:00 p.m. Candoro Marble Building, 4450 Candora Ave., Knoxville. $5 donation. 11/22/2015 Commemoration: Joe Hill funeral re-enactment with a casket, brass band and several performers (including Swedish and Italian). Bucky Halker, Jon Langford, Sally Timms, and more. The Hideout, 1354 W Wabansia Ave, Chicago. 11/22/2015 Concert: John McCutcheon continues his Joe Hill’s Last Will tour in Madison, Wisconsin. 11/23/2015 Concert: John McCutcheon concludes his Joe Hill’s Last Will tour in Rockville, Maryland. Exhibition: Joe Hill 100 Years Part 5. URI-EICHEN Gallery, 2101 S Halsted, Chicago. Posters and other memorabilia from the Industrial Workers of the World General HQ’s Collection, Molly Crabapple, and Pocket Guide to Hell’s Paul Durica. Live music with Bucky Halker. 12/12/2015 Presentation: “Don’t Mourn, Organize!” commemorating the life of Joe Hill and raising funds for Haymarket Books, publisher of the expanded edition of The Letters of Joe Hill. Bill Ayers, Rick Kogan, Maya Schenwar, Jesse Sharkey, Sharon Smith, James Thindwa, and other special guests will read from Joe Hill’s writings and perform his songs. Saturday, Dec. 12, 7:00 p.m., Preston Bradley Center, 941 W. Lawrence Ave., Chicago. Tickets $10 – $45, includes a copy of the new edition of The Letters of Joe Hill, compiled by Alexis Buss, with a new foreword by Tom Morello. Tuesday, Oct. 25, 2016. Musical History of Joe Hill & the Early Labor Movement Tour with the Shelby Bottom Duo (Michael August and Nell Levin) United Auto Workers Local 737, 6207 Centennial Blvd, Nashville TN, 2 pm. Thursday, Nov. 17, 2016. SPECIAL ALBUM RELEASE SHOW! Musical History of Joe Hill and the Early Labor Movement Tour with Shelby Bottom Duo, Nashville Peace & Justice Center, Friends Meeting House, 530 26th Avenue N., Nashville, 7 pm. Friday, Sept. 30, 2016. The Joe Hill Roadshow makes a return appearance at the MSU Community Music School, Lansing, Michigan, 7:30 p.m.. Tickets are $18, $5 for students. Performing are Magpie (Greg Artzner and Terry Leonino), Charlie King and George Mann. November 2015 marks the centenary of the judicial murder of IWW organizer and songwriter Joe Hill. In the coming weeks we will be posting information on Joe Hill’s life, an interactive calendar for posting events around the world marking the centenary, the text of all of Joe Hill’s surviving songs, and other material. Your suggestions are welcome. At the beginning of the Twentieth Century, a great International Exposition of Arts and Industry is held in Gävle, Sweden, to celebrate the prosperity which progress will bring in the years ahead. The play provides scope to facsimilate this as a pre-show, drawing on the talents of local schools or arts groups, Joe Hill taking the opportunity to involve himself in a variety of the musical contributions. Gävle is, however, an impoverished area of Sweden, so, like hundreds of thousands from all over Europe, Joe and his brother leave, believing that they will find a more prosperous life in America. They find terrible pay and working conditions, even while a few employers are making themselves multi-millionaires. Joe comes to believe in the power of unions to transform this situation but, after supporting a long-drawn-out and inconclusive strike by machinists in Chicago, he is converted to the ideals of One Big Union, being initiated by the Industrial Workers of the World (IWW), which seeks to use the power of solidarity not only to improve workers’ conditions but to completely overthrow the capitalist order which oppresses them. As he travels round the country seeking work, Joe finds that the great contribution he can make is to compose songs that will unite the workers. However, after the IWW has had various major successes, it comes to be seen as such a danger by employers that they seek to use any means to crush it. When Joe’s membership is discovered, after he has been arrested in a round-up following a shooting in Salt Lake City, the police cease any search for more likely suspects, a case is constructed against him, and he is executed, despite nation-wide protest. The outrage this causes leads a massive crowd, singing his songs, to accompany his body to the crematorium, whence his ashes will be distributed throughout the world, making him a symbol to inspire workers’ solidarity ever since. Although most sequences are scripted, there is also scope in the play for a company to devise full scenes.